I felt compelled to share with you one of the most extraordinary individuals I have ever met, one whom I am very proud to call a dear friend. He is Allan Ward, Ph.D., emeritus professor of Speech Communications at the University of Arkansas at Little Rock, world traveler, international speaker and author of several books including: Beyond the Visible Spectrum, Post-Modern Zen, Lucian, and Trickster. 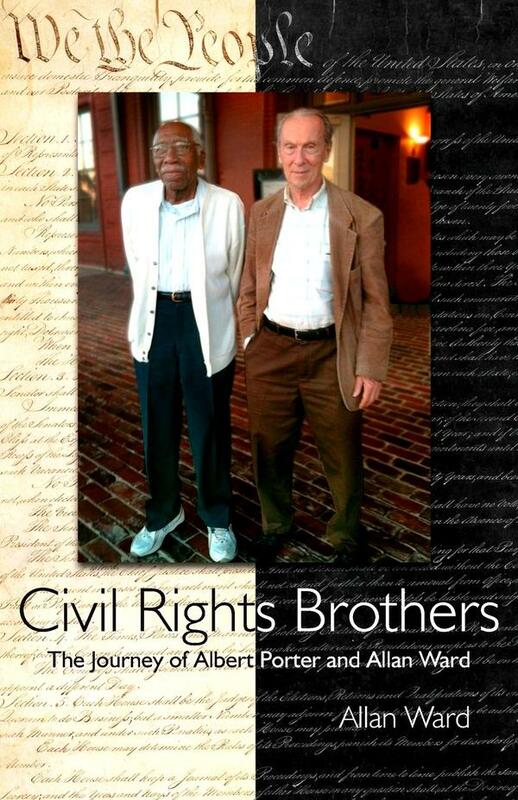 His latest book is Civil Rights Brothers, The Journey of Albert Porter and Allan Ward, published by Award Press in Little Rock, chronicles his friendship and work with civil rights activist Albert Porter. I met Allan when I took the first of many classes he taught; he was my favorite professor! By the way, the word “educate” means to bring out from within, and that’s what Allan did as teacher. I learned more from him about myself and life than in any other class. I will never be able to say enough as to how deeply he has touched my life! Coincidentally, our sons grew up together so we were able to spend time outside of class as well, and for many years to follow. He invited me back to the university to speak to his classes long after I had graduated; I considered it such an honor. After I wrote my first book, a project in which he had a hand, he said I had helped to inspire him to also become an author. He recently gave an interview on public radio; see the link at http://ualrpublicradio.org/post/civil-rights-brothers-journey-albert-porter-and-allan-ward. Hearing his voice and stories once again touched my heart, as he has so deeply for almost 40 years. He knows of my admiration, respect, and gratitude because I have written and spoken of this to him, as well as to his beloved late wife, Helena. If you want people in your life to know how much you cherish them, tell them NOW, before it’s too late! If you have chance to listen to even part of his story, or perhaps read his books, you will not only learn more about yourself and the world, but also how to live more deeply, joyfully, and successfully. This entry was posted in Extraordinary People and tagged Albert Porter, Allan Ward Ph.D., Cathy W. Lauro, celebrating life, civil rights, finding joy, gratitude, inspiration, living deeply, spiritual journey, success, The Inside Advantage. Bookmark the permalink.